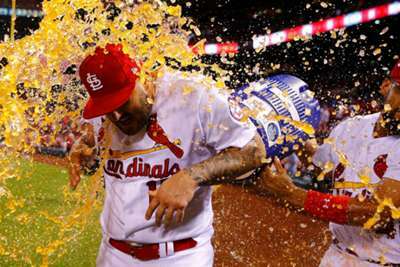 The San Francisco Giants spooked the Cardinals, but St Louis recorded a 5-3 win in MLB on Friday. St Louis were able to get ahead early, scoring a lone run in the first inning and then two more in the fifth and sixth to go up 3-1 over San Francisco. But the Giants responded with their own pair of runs in the seventh to quieten the home crowd. But as quickly as Busch Stadium was hushed, Matt Adams brought them back to their feet with a go-ahead two-RBI double. Adams returned to St Louis last month after being claimed off waivers from the Nationals. He previously spent nine years with the Cardinals. The Cardinals secured a 5-3 win and their edge over the Colorado Rockies in the National League wildcard race. They also kept pace with the Brewers who dropped the Pirates 8-3. St Louis remain three games back of Milwaukee in the race for the first wildcard spot. The Gurriel brothers stole the show, setting an MLB record to become the only brothers ever to have multi-home run games on the same day. The elder brother, Yuli Gurriel, opened with a grand slam against the Angels, which gave the Astros a lead they would hold until the final frame. He also homered in the third and brought in another run off a single to center field in an 11-3 win. Lourdes Gurriel Jr., a rookie second baseman for the Blue Jays and the younger brother, was responsible for two of the three runs Toronto put on the board in their 11-3 loss to Tampa Bay. He rounded the bases in the first and fourth inning. The Angels could not catch a break from Yuli Gurriel and the Astros or the previous opponent in the Athletics. The eight-run loss Friday lowered Los Angeles' run differential to minus-36 over the last three games. It is the worst run differential over a three-game span in 67 years when the then-Washington Senators were outscored 41-3. There might not be much hope left for the Mets, who sit well below contention in the NL race, but there is still a star in Jacob deGrom. The fifth-year New Yorker strengthened his Cy Young case by becoming the only pitcher in MLB history to hold an opponent to three runs or less in 28 consecutive starts. He also made his 23rd straight start in the Mets' 4-2 win over the Nationals, a new single-season record. 7.0 IP, 3 H, 1 ER, 1 BB, 8 K.
The Brewers hope to clinch the series and their place atop the NL wildcard standings. Milwaukee took game one over Pittsburgh, 8-3, behind the bats of four different Brewers and a good defensive performance including a sliding catch from Christian Yelich to seal the win. They will start Zach Davies (2-6, 4.66 ERA) on Saturday while the Pirates will try to respond with Trevor Williams (13-9, 3.16) on the hill.